In his first appearance for the club for exactly two years, Frenchman Renan Lavigne clinched a place in the Premier Squash League (PSL) semi-final play-offs for MB Nottingham after the former champions beat Group A rivals Oxford Health & Racquets in the tenth and final round of the world’s most prestigious squash league. Nottingham, who have shared second and third places in the group with Oxford for most of the season, will face Group B winners Integrity Surrey Health & Racquets, the reigning champions, in one semi-final – while the other will feature runaway Group A leaders Benz-Bavarian Duffield and TWP St George’s Hill. Derbyshire club Duffield, now in the semi-finals for the sixth time in the last seven seasons, romped to the quickest win of the night, beating Courtcraft Pontefract 5/0, while Weybridge-based St George’s Hill earned their third successive appearance in the play-offs after crushing IGT Winchester 5/0. Croydon team Surrey Health & Racquets took one step closer to becoming the first team in the league’s history to win the title three years in a row when they beat Exeter Diamonds 4/1 away from home to finish the season just six points ahead of last season’s runners-up St George’s Hill. But the drama of the night emanated from Nottingham where the 1999 champions hosted rivals Oxford – with a place in the semi-finals waiting the winners. Emma Beddoes put the hosts into the lead with an 11-5, 11-4, 11-7 win over Oxford’sVictoria Bell – but team-mate Mark Fuller failed to capitalise on a 2/1 lead over Andrew Birks as the visitors drew level after Birks clinched the deciding game 11-5. Club stalwart Lewis Walters brought Nottingham back into contention after an 11-5, 11-7, 7-11, 11-6 victory over Ben Coleman – before 37-year-old Lavigne, a European and World Over-35 champion, took on Oxford’s Mark Cairns, a 44-year-old former British National champion. Cairns led 2/1, but a gritty performance from Lavigne saw the former French international clinch a mighty 11-5, 9-11, 8-11, 12-10, 11-5 victory to see his club into the semi-finals. The team weren’t keen to rest on their laurels, however, by throwing the largely irrelevant fifth match: Eddie Charltoncontinued the Nottingham heroics by again recovering from behind to beat the Oxford number one Scott Handley 11-3, 9-11, 8-11, 11-8, 11-9 to ensure an overall 4/1 win. “It’s such a proud moment for the whole MB Nottingham team, managers and club members,” said team manager Nigel Taylor afterwards. “Each and every player has put in some magnificent performances over the course of the tournament and have worn the MB Nottingham shirt with pride. “Our old pal and stalwart Renan Lavigne was really up for tonight and has been really looking forward to representing MB Nottingham. Once again, just like the good old days, he’s worked hard in the Nottingham shirt and helped the team on to the semi finals. Despite already being assured of a play-off place, Duffield finished the pre-knockout part of the season by earning maximum points with a 20-0 win over Yorkshire club Pontefract. England star Tania Bailey came out of retirement to despatch Sarah Bowles 11-3, 11-0, 11-7, and team-mates Aqeel Rehman, Laurence Delasaux, Andy Whipp, and Jonathan Kempfollowed suit by wrapping things up in just over two hours. A win was vital to ensure St George’s Hill’s return to the play-offs – and again the Surrey side achieved their objective in the most determined style, without conceding a single game. Squad number one Tom Richards carried on where he left off in Canada at the weekend when he won the biggest Tour title of his career in Montreal. Richards beat Jethro Binns11-8, 11-7, 11-6, after Swiss star Nicolas Mueller, Hungarian champion Mark Krajcsak, former England stars Stephen Meads and Dominique Lloyd-Walter had set up a 4/0 lead for the Weybridge hosts. 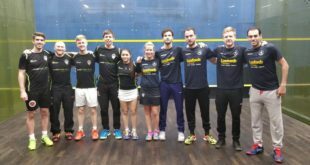 But it was left to the top-ranked German Simon Rosner to clinch victory for Surrey Health courtesy of a straight games win over Welsh champion Peter Creed – before Londoner Peter Barker extended the visitors’ win by beating the valiant Exeter top string Tim Vail also in straight games. PSL stalwarts Team Chichester finished the season in style with a 5/0 win over foot-of-the-table UWE Bristol. The under-strength Avon team picked up two games from the encounter, but on-song Olivier Pett, Anthony Graham, Alex Ingham, Miles Jenkinsand Lauren Briggs brought home maximum points for the south coast side.